I don’t think there’s anyone more hated in recent memory than Johnny Manziel. People despised him in college, they despised him in the NFL, and even on the comeback trail they’re probably wishing him to fail. 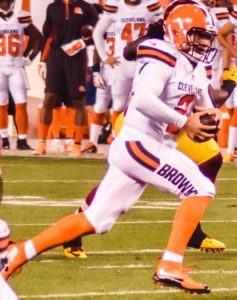 Now don’t get me wrong, Manziel admittedly brought much of the bad press on himself. With the partying with celebrities, run ins with the law, or butting heads with his coaches, it was as if he wanted out. But we don’t truly understand what athletes, particularly ones as high profile as Johnny Football goes through on a day to day basis. We forget they’re people just like us. Manziel has been relatively quiet the past year. His sole purpose seemingly to get back on the football field. Rumours are rampant about playing in the CFL for the Hamilton Tiger-Cats, but that deadline has come and gone. He’s mentioned that he’ll be suiting up for the Spring League, a developmental league and scouting showcase for those looking to get back to the NFL or may have been overlooked by the league at some point. Recently, Manziel was open about his mental health telling Good Morning America that he’s been diagnosed as bipolar. He’s also stopped drinking. He said the booze was a way of self-medicating while he dealt with depression. This is not an easy thing to bring to the forefront and I know that firsthand. I have battled anxiety and depression for over 20 years am fully aware that mental health is not something to take lightly. And for Manziel to talk about that so openly is a very courageous thing to do. Speaking of celebrities, his connection to rapper, Mike Stud is something I’ve been following closely and is very refreshing. Stud, is a former Duke Blue Devil and former teammate of Toronto Blue Jays starting pitcher, Marcus Stroman. Stud suffered an arm injury in college and took to rapping. Needless to say he’s found his niche. It appears these two have developed a pretty tight and healthy relationship. The former Cleveland number one pick has the talent, but has gone through some personal drama that’s been showcased in front of the world. As previously mentioned, we take for granted what athletes do on the field. They are not indestructible, they are just like us, except with a talent that allows them to perform at the highest possible level. I’ve never met Manziel and never spoken to him, but it’s evident he’s a different person now than before. The perceived arrogance replaced by a work ethic no outsider has seen. The public is more accustomed to the money sign, the glitz and the glamour, but over the past few months everything posted about him is about the journey to get back to the field. The attitude, who some take as a negative, is very similar to another misunderstood athlete; Stroman. Stroman has the perception of being cocky on the mound and showing off, but it’s the opposite. As a former professional athlete, you need that edge, that over top persona at times to elevate your game to the next level. There has been plenty of times when I played that I acted out of character, yet it forced my game to the heights it needed to go. Sports loves an underdog story and Manziel is poised to prove the world wrong.